Heartland Ag, Inc. is a regional, independent Wholesale Agricultural Chemical Distributor with its main facilities located in FARMER CITY, IL. Heartland is located on 4 acres in Farmer City's Industrial Park.? We have 43,000 Sq. Ft. under roof.? It contains our offices, our warehouses, bulk terminal and repack container storage and washout area for our 500 stainless steel Mini Bulk Tanks. We have been at this location for over 30 Years, serving the Full service Retailers throughout Illinois and North West Indiana.? 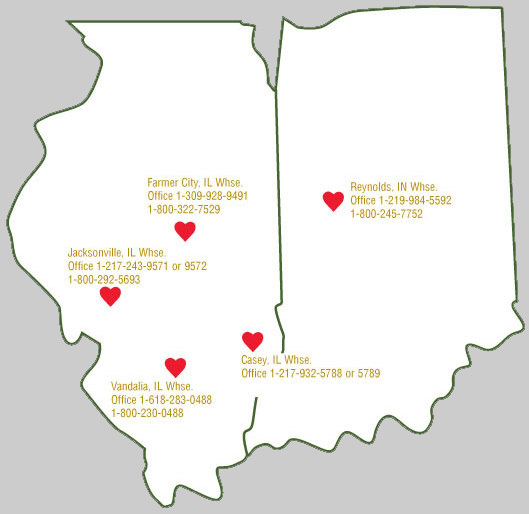 We have additional Warehouse locations in CASEY, IL, VANDALIA, IL, JACKSONVILLE, IL and REYNOLDS, IN. Heartland Ag is a member of the IFCA, ARA and MACPA. Copyright © 2019 Heartland Ag, Inc | Wholesale Agricultural Chemical Distributor. All Rights Reserved.